Large files such as PowerPoint presentations, slide shows or media files take a long time to load from the CD. On average it's safe to calculate ca. 2 - 4 MB per second plus the time it takes for the CD drive to accelerate. This means, then, that a 50 MB file would take approx. 10 - 30 seconds to load from the moment the button is clicked to the time it takes for the window to open. This delay might be confusing for the user, because it appears as though nothing happens when the button is clicked. Sometimes the user will click the button several times, causing the program or document to be started again and again according to the number of times clicked. This problem can be solved by activating a loading message. As soon as a button is clicked, the document or program is started along with a loading message for the user, informing him/her that the loading process is ongoing. Activating the loading message lets the user know straight away that the file or program is being loaded. 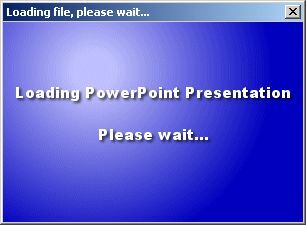 You can make your own loading message by creating a 300 x 200 pixel graphic file in bmp-, gif- or jpg format. The following parameters are required. Once the time entered here has elapsed, the message is terminated. The loading message window monitors the title of all main windows opened. The loading message will be terminated as soon as a window with the title entered here appears. The title is given under "Application - Task". Create a graphic file with the following dimensions 300 x 200 pixels (bmp,gif,jpg) and enter this file using the "Browse..." button. This is how a loading message might look.